No matter what your goals are for after graduation, university is just the beginning. We caught up with jet-setting alumna Hanisha Lalwani for a Q&A on her time since leaving MBS, and the award-winning career that has taken her to Dubai. You graduated from the University of Melbourne with a Master of Applied Commerce (Marketing) in 2009, can you tell us a little about your experience at MBS? I vividly remember arriving in Melbourne on a cold July morning to begin my student journey. In my two years there, I not only gained a privileged academic experience but also many life experiences. Settling in was not the easiest, but living so far from home taught me to be self-reliant. With each subject and group assignment, I interacted with a diverse group of international students, and with eloquent lecturers who were truly experts in their subjects. During my time there, I had a memorable two-week internship in Bangkok facilitated by the University’s Global Mobility Program, and as the perfect end to my Master's program, I was awarded a place on the Dean’s Honours List – I still smile reminiscing the end-of-program gala dinner when my name was announced. What have you been doing since graduating from Melbourne? After graduating I moved to Mumbai, a tough city where I roughed it out for close to five years. I started off as a PR Executive with Madison Communications Pvt Ltd, and within six months the CEO placed me with the team managing the agency’s most prestigious account – Procter & Gamble. I then moved to Impresario Group of Handmade Restaurants. After working in the restaurant marketing space, I felt a calling for hotels and joined Marriott International as the Assistant Marketing and Communications Manager, shifting my base from Mumbai to Pune. In my five-year journey with Marriott International, I have developed my marketing and PR expertise working across nine properties, six brands and three cities, including Dubai, where I now live and work. Personally, I grew my blog, which now has over 1.4 million views, completed a Diploma in Creative Writing, and travelled to 12 countries. Tell us a little bit about your life in Dubai? Dubai is where the world’s most ambitious and driven professionals make a career pitstop to gain valuable Middle East experience. Despite my busy schedule, Dubai has given me many first-time experiences – I achieved two career milestones (winning the MEPRA 2017 Outstanding Young Communicator of the Year and PRCA MENA 2018 ‘Highly Commended’ Best Integrated Campaign), interacted with my role model Dr Shashi Tharoor at the Emirates Literature Festival, learned from global CMOs at Dubai Lynx, met “the world’s happiest man”, Meik Wiking, practiced Yoga, went on sketching tours, and sat in the Virgin Hyperloop One prototype! I feel fortunate to live and work in a city that aims to be the “world’s happiest city”. You recently had an incredible win, the ‘Outstanding Young Communicator of the Year’ Award from the Middle East Public Relations Association (MEPRA). How did this come about? 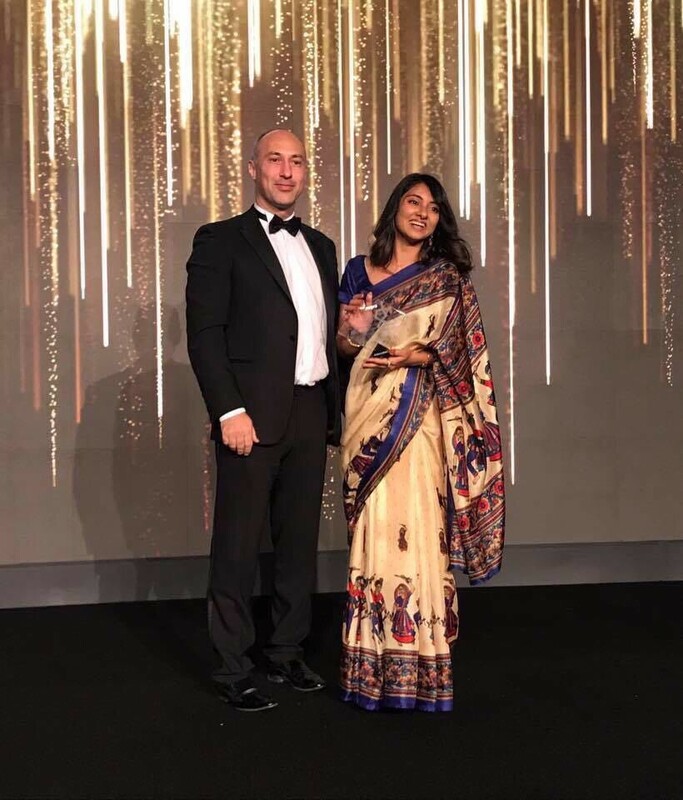 Winning the award within just a year of moving from India to Dubai into my new role with Marriott was only possible because I had courage of conviction, a robust set of campaign results and sound professional ethics. I tried my best to focus on proving my capabilities. I drafted a nomination for the Middle East Public Relations Association (MEPRA) Outstanding Young Communicator of the Year category. Upon being shortlisted, I was interviewed by a panel of eight judges for almost 30 minutes, and lo and behold my name was announced at the awards gala! Winning the award made me realise that self-belief can make all the difference in getting your hard work recognized and feel strongly that young girls should build on their confidence in pursuit of even the biggest of dreams. What’s next? Do you have plans on the horizon? I recently learned that I have been shortlisted in the Young Marketing Leader of the Year category at the 2018 Marketing Society Excellence Awards. I hope to bag this coveted award at the ceremony in June. As far as long-term plans go, I harbour the dream of getting a Ph.D. and eventually becoming a university lecturer. Of course, I would love to someday return to Australia to visit the University’s Parkville campus and sit underneath the shade of its eucalyptus trees, like I used to as a student.